At the shallow end of a deep bay on the Winnipeg River in Ontario, I came upon a sparse settlement of this astonishingly beautiful marsh flower. Funny, I hadn’t noticed it in previous years. Then I found out why. For my education concerning this extremely worrisome, invasive alien, I must credit my friend and budding young horticulturist, Ali Chalke, of Vancouver, B.C. She took one look at it and not only told me it was a troublesome weed, she had in her possession the Most Wanted poster. Flowering Rush arrived in Canada with the earliest settlers, packed along with the animal feed and planting seeds, and since its introduction has steadfastly spread itself from Nova Scotia to Ontario, Manitoba, Alberta, Saskatchewan and British Columbia, essentially the length of Canada (“a half-hour later in Newfoundland”). It has also been confirmed in Minnesota and North Dakota. The problem is, it doesn’t belong in any of these places and is preparing to wreak hell. 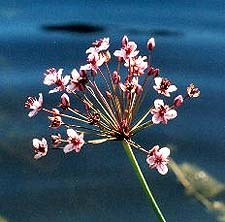 A quick study, Flowering Rush obstructs shorelines, clogs irrigation canals and other riparian areas. Its effect on native plants is as yet unknown. Heading up the international study of this alien’s spread and impact is Chris Eckert, Department of Biology, Queen’s University, Kingston, Ontario. IF YOU SEE THIS PLANT, contact Eckert at eckertc@biology.queensu.ca at your earliest convenience, noting exact location and volume of the plant. Flowering Rush is quite distinctive; rose-colored flowers, each one inch-wide, in umbrels, the plant growing in a leafless stalk one to four feet high, in standing water. Slender, grass-like leaves also rise from the water and will be in evidence—for the photo on this page I pushed one flower head off to the side for a clearer shot. Looks like they need our help on this one. Pity. Gorgeous plant.